York Council officials have now given a preview of their plans for the redevelopment of the Lowfields school site (above). 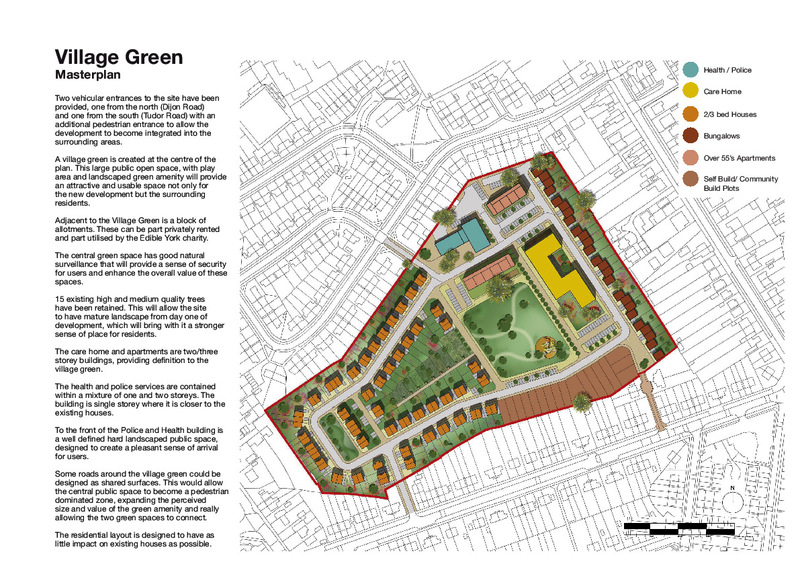 The scheme – called “Lowfield Green” (sic) – includes the “provision of a care home, age related housing including bungalows, a health and police centre, family housing, plots for self-build and public open space”. The scheme still involves building on the sports pitches but officials claim they wish to retain the mature trees on the site and provide a “pocket park and allotments“. The Council plans to relocate the football provision to a site off of Tadcaster Road, in partnership with Woodthorpe Wanderers. This will allow them to have fenced off pitches which help with the “player environment”. Residents are invited to two drop-in sessions with council officers who will explain the plans and answer questions. The drop-in sessions will take place on Wednesday 12 October and Tuesday 18 October between 4.30pm and 7.30pm at the Oak room, Gateway Community Church on Front Street. The plans will also be on display at Acomb Explore Library Learning Centre from Wednesday 12 October for 3 weeks where residents will be able to feedback. Alternatively residents can have their say by emailing lowfield.development@york.gov.uk or see www.york.gov.uk/consultations. Even a casual glance to the proposals confirms that they represent a gross over-development of the site. Fundamental mistakes include the provision of a through road from Dijon Avenue to Tudor Road (previous plans had indicate access from two cul de sacs to minimise short cutting). The plans include two big traffic generators. One is the GP surgery which is to be transferred from its present location on Cornlands Road. While there are bus stops within 100 metres of the Cornlands Road site the nearest equivalent public transport point to Lowfields is about 1/4 mile away on Front Street (although a one direction service does serve Tudor Road). This means that most who attend the surgery will drive to the site. Another big traffic generator would be the proposed Police depot. The Police intend to close their Acomb Road station and relocate vehicle parking, messing and briefing facilities. There are no plans to provide a manned police reporting desk (either here or at the Acomb Library which is the location favoured by the majority of local residents). However 24/7 vehicular access will be required. Taken together the Surgery and Police depot will have a major impact on traffic levels and parking problems in what is currently a quiet residential area. All in all these are very disappointing proposals. The Council has not yet even responded to the public consultation comments submitted a couple of months ago when the Draft Local Plan revealed that the number of homes planned for Lowfields had more than doubled. The Council should let that process conclude before tabling new plans. There is a suspicion that the rush to sell off the site – which could raise £4.5 million – is simply a way of funding the extravagant plans for the Burnholme site on the other side of the City. EARLIER – Residents have criticised the York Council for not updating them about the future of the Lowfields school site. Many returned comment forms when a Local Plan consultation took place in Acomb 2 months ago. No one has received any feedback. Residents had also been told in the summer that a further consultation event would be held during October but so far the Council have not confirmed that this will actually take place. 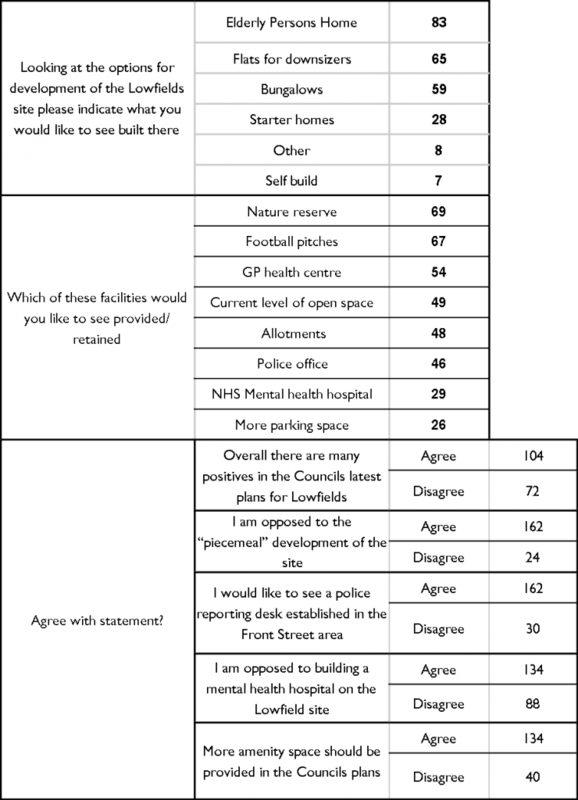 Residents completing a survey form had criticised the Council plans which would see building on the school playing fields. This was a direct contravention of assurances given when the school closed over 6 years ago and flies in the face of national government policy on the retention of sports pitches and facilities. Residents want to see the site used predominantly to provide accommodation aimed at older age groups. They have been particularly concerned about proposals to move police vehicle garaging & messing facilities from the present York Road site into the area. They fear that 24/7 access will exacerbate, already difficult, traffic and parking issues in the small estate. The Council is next scheduled to discuss the Lowfields plans at a meeting taking place on 8th December.